Let’s say you have a dataset and it read in 15 rows. You have this tablix on your report that has 10 rows and 2 columns. The first column represents the priority (1 – 10) and the second column represents a count. and show a grand total as shown above. This says: If the value of the Priority of the row being processed = “1”, then sum 1, else sum 0. For each row where the Priority = “1” it will continue to sum “1”. ReportItems! represents the name you gave the textbox. 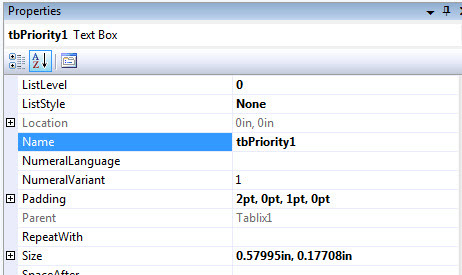 For example, in the properties window for the Priority 1 textbox, type ‘tbPriority1’ for the Name property. Another alternative to this? Have 10 different select count(*) SQL statements for each priority and simply assign the value of each count to each of the ten textboxes. As you can see, the above method is more efficient.